Now, samples taken from two different drill sites on an ancient lake bed have yielded complex organic molecules that look strikingly similar to the goopy fossilized building blocks of oil and gas on Earth. Note from Pastor Kevin Lea: This news is no surprise to those who have followed Dr. Walt Brown’s Hydroplate Theory (HPT) explanation for the flood of Noah. God’s word states that the biblical flood of Noah started when (on one day), all the fountains of the great deep were broken up causing it to rain globally for 40 days and nights, and where the water continued to increase on the earth until the 150th day (Genesis 7:11-24). The subsequent rupture of the crust would have allowed this pressurized water to escape with extreme, supersonic velocity. As it did, some of the ejected water and material from earth (including pulverized living matter) were ejected into space at escape velocity causing it to go into orbit around the sun. Some of this water and material would have then collided with Mars and the other planets. What is being found on Mars now is what has stayed there to this day (some has evaporated out and/or been swept into space by the solar wind and lack of gravity to keep it on Mars or in its atmosphere). All of the evidence and discoveries from various space projects sent to study Mars are perfectly consistent with (and not surprising to) this biblical and scientific narrative by Dr. Walt Brown. Tragically, the now discredited Big Bang theory along with Darwinian evolution paradigm have handicapped the NASA scientists from seeing the obvious, even when it is poking them in the eye. These evolutionary minded scientists continue to be baffled by the presence of methane on Mars, as well as the fact that the concentration of methane in the Martian atmosphere, measured over five-earth years, is seasonally cyclic, increasing in the Martian summer and decreasing in the Martian winter. Such summer-winter cycles here on Earth are unmistakable signs of metabolism shown by all living organisms here on Earth. These observations are expected and explainable by HPT scientists. Evolutionary scientists are also at a loss to explain how complex organic molecules can be on Mars. It should be noted that for almost two centuries they have been at a loss to explain why they are on Earth (since no one can explain how time and chance can create them, here or on Mars). 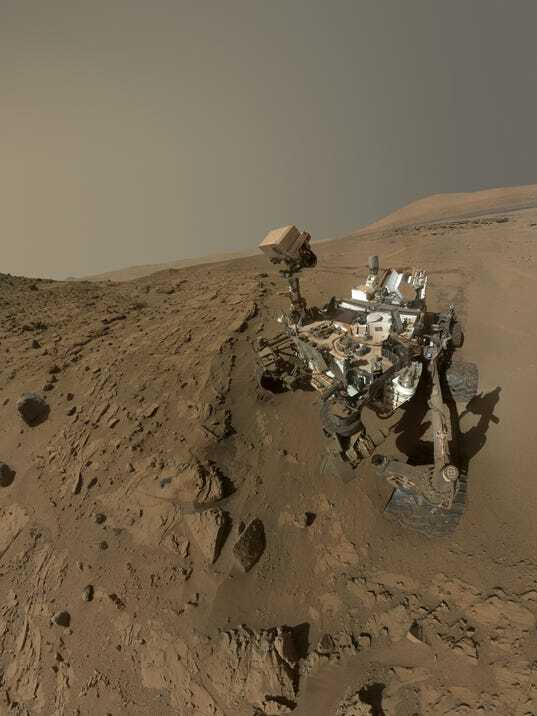 You may now start to hear from them that life evolved on Mars. Don’t be deceived. The student of the Bible and science can explain how life started here and how organics ended up on Mars. The life on Mars—most likely bacteria (not little green men)– was delivered along with an abundant supply of food by debris, especially gigatons of vegetation fragments, launched from earth as the flood began about five thousand years ago (not the three billion years they use based on their false paradigm) . This discovery adds to the number of fulfilled scientific predictions that Dr. Brown has made over the years, as noted in his book. Those who have followed his work have come up with the cliché that “all scientists work for Walt Brown”. Nations and scientists have spent billions of dollars and man hours on science projects to prove evolution and the Big Bang only to have the results of these projects dispel the myth of evolution and instead support the biblical premise of divine creation followed by a global flood; a flood that affected not only this earth, but the solar system that we live in. PS – Tragically, many Christians who search for answers about creation and Noah’s flood have not heard of Dr. Brown or his theory, even though they may subscribe to Answers in Genesis (AiG), Creation Research Society (CRS), Creation Ministries International (CMI), or Institute for Creation Research (ICR). How could this be when a Google search on: “creation and the flood”, “origin of asteroids”, “origin of comets”, etc., which are all related to Dr. Brown’s hydroplate theory, are either the first hit or on the first page of hits pointing to Dr. Brown’s online book? Information published by these other creation organizations does not garner anywhere near the same interest that is implied by these search results. Many are convinced by these organizations to discount Dr. Brown’s work when they accuse Brown of not submitting his work to peer review. By peer review, they mean submit his book to them for their critique. This is like saying that no one should have listened to Galileo teach that the sun is the center of the solar system because he had not submitted his findings to the Pope for review. They push this false narrative to hide their unethical bias against Dr. Brown. So allow me to suggest that you should read Dr. Brown’s work for yourself instead of being deceived by their censorship and discrediting, you will be glad you did.